Congratulations to our WINNER: Dr. Tess Brady! 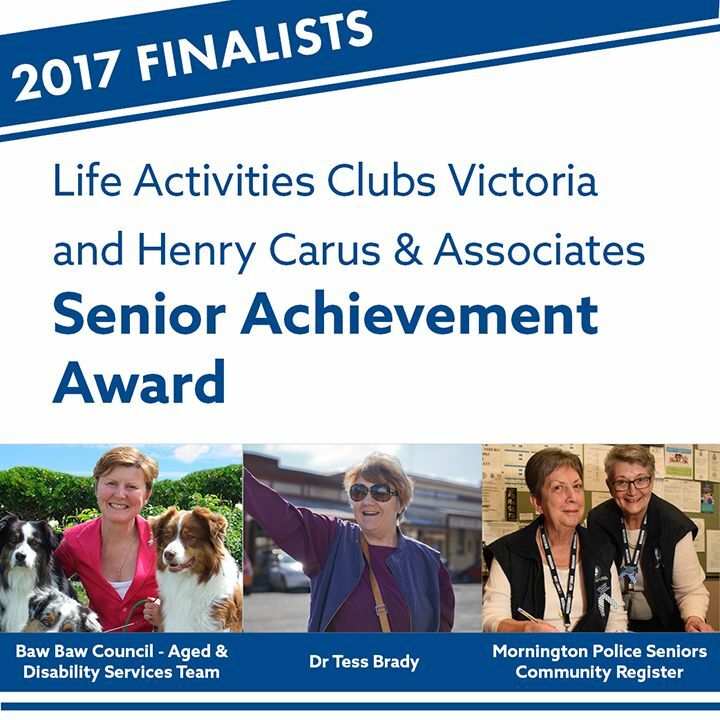 The Finalists have been selected for the Life Activities Clubs Victoria and Henry Carus & Associates Senior Achievement Award in the 2017 Victorian Regional Achievement and Community Awards. The Awards are all about the passion of people who are committed to making regional Victoria a better place to live. The Life Activities Clubs Victoria and Henry Carus + Associates Senior Achievement Award recognises individuals, organisations or corporates that have excelled in improving the wellbeing of people in the second half of life, particularly by promoting ‘self-help’. Older people in regional areas experience issues that do not impact many people in heavily populated areas and distance from the metropolitan area may adversely affect their quality of life. Many of these people are active, capable and independent. We wish to acknowledge the inspiration of the organisations and individuals who strive to improve the lives of our ‘elders’ through the promotion or facilitation of self-managed groups, activities or forums. Baw Baw Council – Aged & Disability Services Team commenced a pilot program in 2012 named ‘The Pet Program’. The program supports residents who are frail, aged or have a disability, to care for their pets. Volunteers assist with walking dogs, transportation of pets to the vet and grooming or bathing and short-term feeding. Approximately 450 hours of pet support has been provided over the past year. Dr Tess Brady of Clunes led the organisation Creative Clunes, transforming the rural town of Clunes from decline to a prosperous vibrant community. Volunteer run for nine years, Creative Clunes created an annual book festival and opened the first community bookshop. Now the town boasts six independently run bookshops, the annual festival attracts around 20,000 guests, they have monthly author talks and the town is a centre for cultural tourism. Mornington Police Senior Community Register was started in 2001 by a group of mostly retired volunteers. They aim to make clients feel safer by creating a relationship with the Police, and provide day trips, lunches and activities to keep them involved in the community. Volunteers provide home visits and telephone calls to isolated, elderly people. Over 4,250 people have been involved since the register’s inception.